Who wants to win this fabulous prize pack from The First Years? Check out what you could win! Brought to you by The First Years and Green Scene Mom. We are excited to share with you an exciting opportunity from Green Scene Mom and The First Years, who is now casting young families with unique stories for a cool new online reality series. This is a fun way to show off your unique story, and families who enter have the chance to score $7,500+ in prizes. The more individual the story, the better! We are offering an awesome The First Years giveaway too! The First Years is looking for a cast of characters from a wide variety of backgrounds to show America what the first years of parenting are really all about. New parents with children ages newborn to 20 months and expecting parents are all invited to enter. All it takes for a shot at starring in The First Years Welcome to The Family Video Series is a 30-second Smartphone video and 100-word (or less) story about what makes your family's story totally unique. We invite you to learn more and enter your family's story at family.thefirstyears.com. Willie Wilkov, the Chief Marketing Officer of TOMY International shares the inspiration behind the contest. "The First Years totally gets what the first years of life are really like, which is far from picture-perfect. Our video contest is all about documenting the joy, laughter and unpredictable moments that quite often become the most memorable ones. We're celebrating real families and the individual experiences that make their parenting journey all their own." 1. A Story: In 100 words or less, describe what makes your new family totally unique by giving an up-close-and-personal look at the parenting journey your family is taking. The more individual their story is, the better! 2. A Video: Share a 30- to 60-second video that shows what parenting moments are really like in your home — the good, the bad and the "I-can't-believe-that-happened" moments. Think reality TV, only actually real! 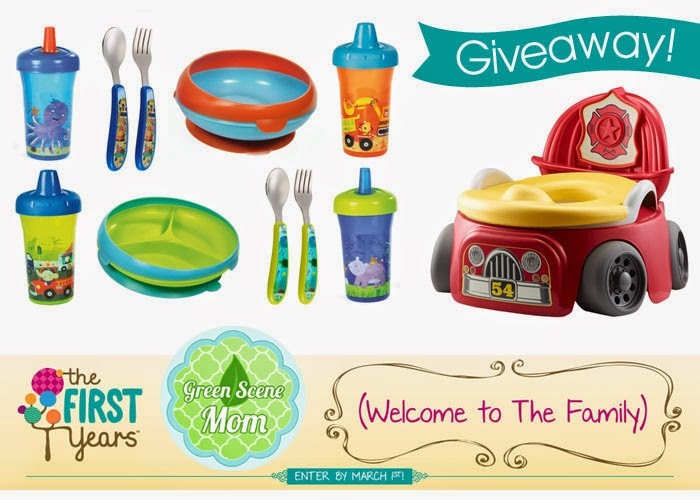 Green Scene Mom is also excited to offer a fabulous giveaway of brand new toddler products, sponsored by The First Years — just a small taste of what the winners of the video contest will receive! Enter our giveaway below for the chance to win one (1) prize package of (boy or girl) toddler products! One winner will be chosen 3/2/15. Giveaway is open to entries with a US mailing address. Each household is only eligible to win 3 TOMY product prize packages, via blog reviews and giveaways, each calendar year. Only one entrant per household per giveaway. If you have won the same product prize package on another blog, you will not be eligible to win it again. Winner is subject to eligibility verification. Green Scene Mom and its affiliated blogs are not responsible for fulfilling sponsored prize obligations; prizes will be shipped directly from the brand. i am throughout this post to help you along with your brief cheap wants. the real Cash economical loan may be a extraordinary item to start to alternatives and products that will allows quite few persons, rather such as you, day-to-day! Anytime urgent situations occur, don’t stress! appear observe individuals. we usually seem to evaluate at currently there to match your desires together with most individuals take into consideration payday loan montgomery supporting anybody along with your cheap wants.